If anyone needs an excuse from being away from their blog it should be the working mom of a First grader on the “back to school” season. Luckily I’m not asking for forgiveness because this recipe is totally worth the time i spent researching it. Saying that the start of school in Finland is a difficult time for a parent would be such a blatant lie, even I wouldn’t dare to try! Seriously, could this country make it any easier and stress-free for a parent? I am completely amazed at the low exigence level from the school system regarding the simplicity of interacting with teachers in Finland. Especially when comparing to the similar concept of “la Rentrée” back in my home country France. As a child I remember observing the meltdowns at the supermarket, the weary parents holding a 3 pages double sided list, indicating the required supplies and books needed to be a “Bon Élève”. Each class with a different set of very specific items to purchase. For History; a small notebook with big lines; for Math; a big binder with double sheet / small lines and white space, every second page for graphs. For Geography, transparent paper and color pencils, …. and to each, a collection of stickers, covers, protections and intercalaire to go with. Malheur to the forgetful child whose parents would not have acquired all the needed supplies prior to the class, for the shaming and embarrassment would be of no end! As children, we were of course oblivious of the cost and would have no mercy, begging our parents to purchase the latest brands of “cahier de texte” and only accept to wear the most expensive backpacks. These backpacks, that would eventually become our worse enemies, loaded every day with kilos of books and homework for the next teary two hours of the evening. I now realize, putting my first child to 1st grade; how easy we have it here in Finland. Not only am I not required to go through the mayhem of school supplies purchase, because the basic requirement is a pencil and an eraser (the rest is being provided by the school) but the size of my daughter’s backpack is so tiny I was afraid at first it wouldn’t fit the one book she was expected to carry back home for her “kotitehtavä”. As for the homework, I’m not sure the 10 minutes of unsupervised exercise can even compare to the horrendous “devoirs de maison” I brought home every night to my parents’ dismay. I’m grateful my kids are part of an education system in which not only the books are provided free of charge for every class, but are also wonderfully illustrated and look more like games than tedious assignments. 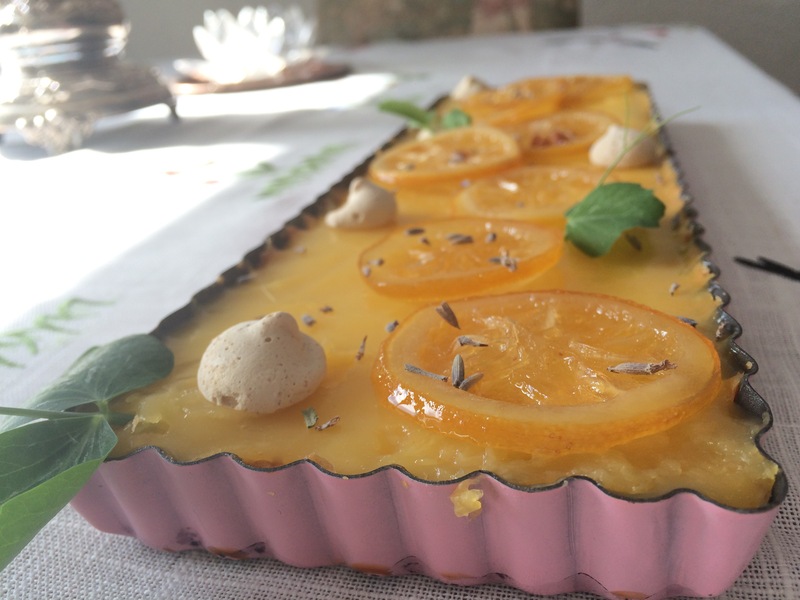 With so much time NOT worrying about the start of school, I could actually have fun testing around with some classic recipes such as this lemon tart & Chai Masala & Chia oatmeals cookies (coming soon!) recipes. So here you go, lucky you – My take on the French classic which I dedicate to the Finnish school system! *Note: the candied lemons are an optional topping. you can also replace it with a meringue made from the 2 egg-whites leftover beaten with a pinch of salt, 1dl of icing sugar until stiff peaks form. 1- The topping: Prepare the candied lemon the night before by gently simmering the thinly sliced lemon into a syrup of equal part water & sugar for about 1 hour. Leave to dry overnight on a cooling rack. 2- The Shell: Preheat the oven to 200C. Meanwhile, combine all ingredients and place into a pie tin or a round tart mould. As the pastry is fairly soft you can spread it with your hands lightly wet or a spoon. Cook for approximately 20 minutes, or until golden. Leave to cool. 3. The filling: while the pie is cooking, wash & Zest the lemons, juice them and combine all ingredients in a small saucepan. Mix until combined and cook on medium to low heat until the liquid starts thickening. Taste for sweetness and adjust to your preference (I like my lemon really tart, so feel free to add sugar if you don’t). Tip: Always add the cornstarch to a cold liquid to avoid it from solidifying too fast. Loved it? Share it with us on by tagging us @hungryinhelsinki or using the #hungryinhelsinki on Facebook & Instagram. We love to see what you are up to!